So here we are at the end of season 6. All the dragons have returned, Daenerys is back in command with Tyrion beside her as her right hand Imp, Arya is a person again, Jon Snow survived the Battle of the Bastards, Sansa is finally a widow, Jaime completed his storming the castle task and poor, beleaguered Cersei is facing execution without the possibility of the right to a trial by combat. Too bad about that nixed trial by combat, with The Mountain, aka Ser Robert Strong, as her champion that would have been an easy out for her, right? There has been much speculation as to whether our favorite blond villainess will meet her end at the end of season 6. Some are laying bets on the execution, while others speculate sororicide by her brother/lover Jaime over that nasty blue wildfire stash. I'm betting on the return of Cersei next season, whether alive or as a vengeful spectre. She's a survivor and, shhhhhhh, she's reportedly getting $500k per episode to continue her nefarious scheming. And don't think she won't be hell bent on revenge. 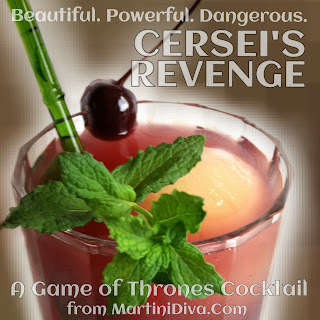 CERSEI'S REVENGE Beautiful. Powerful. Dangerous. DIRECTIONS: Fill a round ice mold with fresh pineapple juice and freeze. Cover nice quality cocktail cherries with some of the Cruzan 151 and let soak overnight. Add all the ingredients except the overproof rum to a cocktail shaker filled with ice and shake until chilled. Strain over the pineapple ice sphere in a chilled glass. Float the Cruzan 151 on top, garnish and serve icy cold. 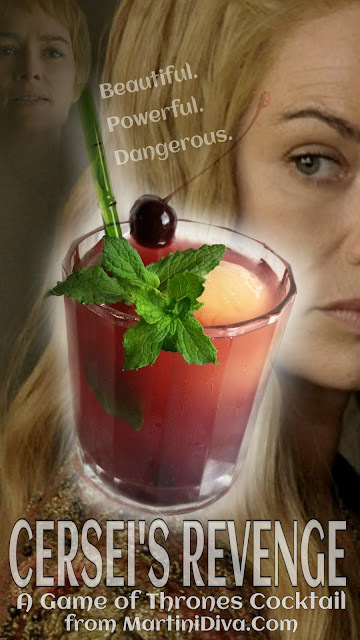 Be sure to try out all my other Game of Thrones cocktails over the long wait for our return to the Land of Ice and Fire next year.